Not a picture of a macaron. Because it is no more, or so it is said. The beauty of the macaron, the good macaron, which Pierre Hermé understood straight away, is not only in their infinite variations of colour, their bijou collectible quality but in the intense shot of flavour suspended between two eggshell thin almond biscuits. Who was it that said that the first bite is the most important? That subsequent mouthfuls are all ever-decreasing in intensity and novelty? The macaron is only one mouthful, two if you are sharing unwillingly, and so you have continued bursts of different flavours: acidic yoghurt and raspberry, concentrated freshness with cucumber, mint, apple and rocket. The macaron may well have been squashed in its delicate shell by the more substantial éclair (there was a brief interlude where the cupcake was a pretender to the crown but the French refused to take it seriously – the choux puff tried but was too similar in shape to its usurped cousin). Indeed, I had tired of the soft yielding sweetness of the macaron and of its exorbitant prices and strayed from its cult worship, seduced by greed for a longer, larger éclair. People, at least Parisians, have moved on, bored of the endless sub-par macarons in every corner bakery. A bad one is sweet, cloying, all food colouring and no essence. But it is impossible for me to pass one of Hermé’s ebony box boutiques without entering, for which I am thankful to no longer be living in the Latin quarter but in the less chic 19th arrondissement, less macarons and more kebabs. We lingered on the way back from the Tuileries, took our time choosing the perfect parfums. He really knows how to play with the palate, does our Pierre. Not always to everyone’s taste: some adventures in wasabi were apparently short-lived, while the idea of his Christmas editions of foie gras and fig, or white truffle and hazelnut can sound bizarre although they taste divine. (A visiting friend tried the latter and claimed, “Now I can die happy. Really.”) He dreams up his new featured dessert or fétiche range like the recent ‘Céleste’ (passionfruit, rhubarb and strawberry, pictured above) and his team of designers and pastry architects will do the experiments to produce a new capsule collection of haute pâtisserie: a macaron, a millefeuille, an émotion (a layered dessert in a glass verrine). He need only be the ideas man, and the clever business man who has made his name a global empire. He knows how to leave you desperate for more, coming back for that surprised first bite over and over. 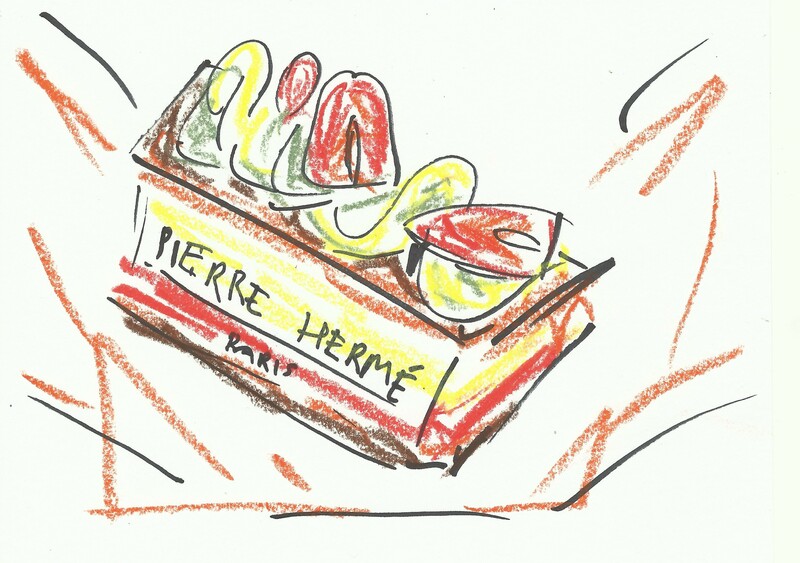 Pierre Hermé – to be found all over the world. Five main boutiques and several concessions in Paris alone. My favourite is on the rue Bonaparte near St-Sulpice, but the rue Vaugirard boutique has much less of a queue on weekends. Store locations and opening times (as well as unfairly appetising pictures).